Partial dentures are devices replace missing teeth. 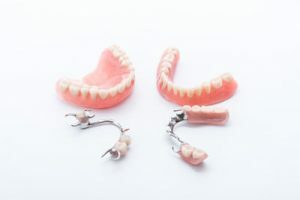 Apart from the increased confidence and self-esteem you get when you restore your smile, partial dentures can help you carry out everyday functions like chewing food with ease. Eating certain foods can become quite complex when you are missing teeth. Although dentures help solve serious issues that affect many people, improper care of your dentures can leave you vulnerable to some harmful health risks. What are some of the health risks associated with partial dentures? 1. People always put the gums at risk when they wear partial dentures regularly. This is especially true if one does not take care of his or her dentures properly. Partial dentures increase the amount of plaque in the mouth — which can act as a perfect breeding ground for bacteria and other harmful organisms leading to oral diseases like tooth decay, periodontal disease (gum diseases), and gingivitis. 2. Apart from that, ill-fitting partial dentures can cause trauma to the gums or even cause abrasions to the teeth. 3. The remaining teeth may become misaligned if the partial denture is not designed properly. This is one of the reasons why people should always be very careful when choosing a partial denture for missing teeth. 4. Patents are also at a high risk of root caries when they wear partial dentures for a long time without breaks in between. The chances of demineralizing the teeth greatly increase when people wear partial dentures for long periods, leading to root caries. This becomes even more likely when people fail to take proper care of the dentures. 5. If someone does not properly clean the dentures, plaque starts building up between the device and the remaining teeth. If dental plaque is not removed and comes into contact with the gums, the teeth might become inflamed. This increases the odds of the teeth eventually falling out. 1. Give yourself a break from your partial dentures once daily especially when you go to bed. This gives you room to take care of your remaining teeth, and, most importantly, clean your dentures. The best way to do this is by soaking your dentures in warm water or denture solution to kill bacteria and other harmful organisms. 2. Wear properly fitted partial dentures. This reduces teeth abrasion, decreases misalignment of your remaining teeth, and keeps your teeth in the best position and shape. 3. Maintain your oral health at all times. This involves cleaning your teeth and flossing your teeth on a regular basis. 4. Visit your dentist regularly for checkups. We will examine your remaining teeth and determine if there are any emerging issues that we need to address. 5. Eat smart. Avoiding sugary foods can help keep both your gums and teeth healthy at all times. Dentures can help you restore your quality of life, but these devices need to be properly taken care of. Contact GK Dental PC at (617) 826-6075 to find out more about how to properly take care of your partial dentures.